Joel Whitmore’s students wanted a snack one day, so he made a quick salad. He said he didn’t think much of it; he was just putting together a simple, healthy snack. He brought it back to the students when one eighth grader told him it was the first salad she’d ever had. Whitmore, 23, works as a FoodCorps service member at three Salem-Keizer middle schools. FoodCorps is a nationwide non-profit that works to increase food and environmental literacy, community food security, and interest in agricultural careers among children and their families. While it was hard for Whitmore to imagine a teenage student never having had a salad before, he said it happens more frequently than some might think. In Oregon, one in four children live in poverty, one in five children are at risk of being overweight or obese, and half of all students in Oregon public schools rely on free or reduced school lunch programs as their primary food source. Organizations like FoodCorps are working to change that. The FoodCorps team consists of AmeriCorps leaders like Whitmore who connect kids to real food and hands-on activities that help the students grow up to be healthy. Working under the direction of such local partner organizations as the Salem-Keizer Education Foundation, and partnering with educators and community leaders, they implement school gardens, cooking classes, nutritious meals, garden curriculum and more. Some children affectionately call the organization “Food Crops,” said Kat Barton, another FoodCorps service member. 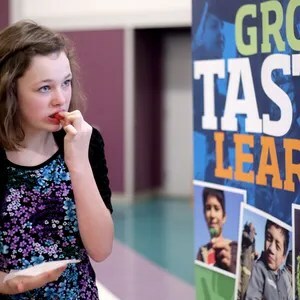 Oregon is a “mature-farm-to-school state,” according to FoodCorps. It’s the first state to institutionalize a farm-to-school and school-garden coordinator in both state agencies for agriculture and education. There are more than 600 school gardens across the state today and more than 200 producers provide Oregon products in school meal programs. FoodCorps is in its fifth year nationally. As of December 2015, FoodCorps programs in Oregon have reached more than 14,470 children, created 29 garden projects, harvested 2,572 pounds of garden produce, and mobilized more than 600 community volunteers. As a FoodCorps fellow, Aaron Poplack focuses on guiding and supporting Oregon’s cohort of service members, assisting FoodCorps in program implementation within the state and region, and helping to build statewide capacity for FoodCorps programming under the direction of the Oregon Department of Agriculture. Whitmore agreed, saying that growing up, preparing meals and eating is historically a family, community activity. Poplack said kids are “110 percent” more likely to try something they grew. He said that is evident when kids try all kinds of fruits and vegetables because they grew them in the garden. Barton works with elementary students in the Salem-Keizer school district. She said the students help each other and take real ownership of the club; they find a sense of belonging. But without time outside, it’s exceptionally hard for students like these to focus.